However, if you rely on this formula alone when designing a sewer jetter you can overload your pressure washer or pump. That’s because the formula doesn’t account for pressure buildup in the jetting hose and the manufacturing tolerances of different grades of nozzles. In this article we’ll show how the quality of a nozzle can impact the performance of your sewer jetter. We’ll describe three different grades of nozzle that you can buy, starting with the least expensive. Consumer-grade sewer jetter nozzles can be purchased for less than $10 at pressure washer parts suppliers and Internet auction sites. Most are unbranded or carry the supplier’s house brand. Like the nozzle in this photo, some have their country of origin stamped into the metal surface. While they’re inexpensive and easy to find, the manufacturing quality of consumer-grade nozzles can be inconsistent. In our tests the true orifice sizes of many samples differed by more than 40% from their rated sizes. We’ll talk about the practical implications below. Professional-grade sewer jetter nozzles are branded products manufactured by companies like Suttner America. 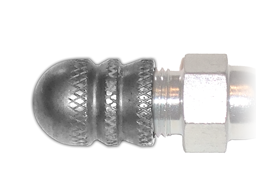 Sold by authorized resellers starting at under $20 for fixed style nozzles, this type of nozzle is offered in a range of standard orifices sizes. Note that Suttner nozzles are designed for an O-ring style end fitting like the one in this photo. This type of fitting is not common on US-made jetter hoses. In tests of name brand professional-grade nozzles, the orifices sizes consistently differed from the rated size by less than 20%. Custom-made sewer jetter nozzles are manufactured by companies like Aqua Mole in the USA and EHLE in Germany. Because their jet orifices are drilled to order, custom-made nozzles can precisely match the limits of your pressure washer and jetting hose. You can also specify different nozzle patterns to meet your cleaning needs – say, a pattern for stronger pulling force to draw the hose deep into long drain lines, or one for more thorough scrubbing of dirty pipe walls. US manufacturers sell fixed style custom-made sewer jetter nozzles starting at around $40, while at today’s exchange rates the German-made products cost 2-3 times as much. The orifices on US manufactured custom-made nozzles were found to vary by less than 10% from their rated size. What are the practical implications of these nozzle grades’ different manufacturing tolerances? Say, for example, you’ve got a 3,000 PSI pressure washer that delivers 3.0 GPM and you plan to use 100 feet of 1/4″ ID sewer jetter hose. Our formulas tell us that for this flow there’s a small pressure drop in that hose– around 286 PSI– so your nozzle pressure can be as high as 2,714 PSI without overloading the pressure washer. The ideal orifice size for the nozzle is around #3.6. If you’re using a consumer-grade nozzle, it’s recommended that you divide the ideal nozzle size by 0.6 to account for the manufacturing tolerances discussed above. 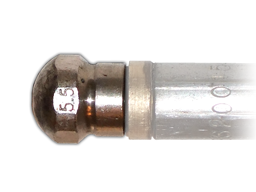 The closest available consumer-grade nozzle is a #6.5 that delivers at least 852 PSI of cleaning and pulling pressure. In this scenario you’d be operating at less than one-third of the potential of your pressure washer and jetter hose. If you’re using a professional-grade nozzle, it’s recommended that you divide the ideal nozzle size by 0.8 to account for manufacturing tolerances. The closest available standard size is a #4.5 professional-grade nozzle that will deliver at least 1,778 PSI of cleaning and pulling pressure. If you’re using a custom-made nozzle, it’s recommended that you divide the ideal nozzle size by 0.9 to account for manufacturing tolerances. 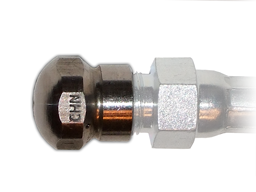 You’d buy a #4.0 custom-made nozzle that delivers at least 2,250 PSI of cleaning and pulling pressure. The added cost of a high-quality nozzle that pulls and cleans with greater force can amount to only pennies more per use over the service life of your sewer jetter nozzle. Of course, you can skip the math and buy a ready-to-use sewer jetter, manufactured from quality US-made components, that’s custom-matched for your type of pressure washer.